This is the most recent information about Lobo that has been submitted to amIright. If we have more information about Lobo, then we provide a link to the section where it appears (the actual page whenever possible). 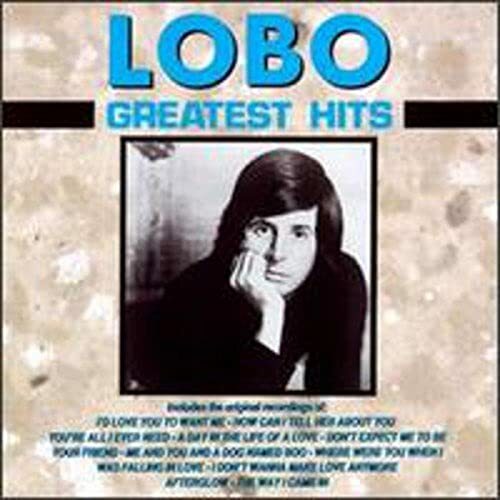 Lobo originally planned to record a song named "Me And You And A Setter Dog Named Boo". But then they shortened it to eliminate the identification of the dog's breed. They did that in hopes that the song would get posted on amiright.com under the heading "Remove a setter from a long title". "I Sure Took A Long, Long Time" originally "It Sure Took A Long, Long Time"
"It Sure Took A Long, Long Tie" originally "It Sure Took A Long, Long Time"
"Me And Yu And A Dog Named Boo" originally "Me And You And A Dog Named Boo"
Yu is a Chinese surname (or a Japanese firstname). "Me And You And A Dog Named Bo" originally "Me And You And A Dog Named Boo"
"Don't Expect Me To Be Your Fiend" originally "Don't Expect Me To Be Your Friend"
That's good, I didn't need anymore enemies. There are additional Lobo song titles with a letter removed available. "Zit Sure Took A Long, Long Time" originally "It Sure Took A Long, Long Time"
"It Sure Took A Long, Long Timer" originally "It Sure Took A Long, Long Time"
"Don't Expect Mae To Be Your Friend" originally "Don't Expect Me To Be Your Friend"
"Don't Expect Meg To Be Your Friend" originally "Don't Expect Me To Be Your Friend"
"Don't Expect Moe To Be Your Friend" originally "Don't Expect Me To Be Your Friend"
There are additional Lobo song titles with a letter added available. "It Sure Took A Long, Long Tile" originally "It Sure Took A Long, Long Time"
"It Sure Took A Long, Long Lime" originally "It Sure Took A Long, Long Time"
"It Sure Took A Long, Long Tire" originally "It Sure Took A Long, Long Time"
"Me And You And A Dog Named Bob" originally "Me And You And A Dog Named Boo"
"Me And You And A Doe Named Boo" originally "Me And You And A Dog Named Boo"
Now they have a pet deer! There are additional Lobo song titles with a letter changed available. There are additional Lobo duets that haven't been done yet available. How I love the world of green men. How I love that country ham. And what the hell to say with the man? What the elephant say with the man? There are additional Lobo misheard lyrics available. I was very young and thought the way it was sung really sounded like "what the hell to say with the man". After some years I realised with was 'elephant', and relating to that elephants have supposedly good memories, perhaps this elephant was telling the man what it remembered, hence "what the elephant say with the man?" There are additional Lobo misheard stories available. Vehicles are incapable of bugging anyone. Bolo Submitted by: Robert D. Arndt Jr.
"You Abandoned A Demon Dogma" originally "Me And You And A Dog Named Boo"
I'll never forget the day we motored stately into big L.A.
An original US state of Georgia; St. Paul, Minnesota; and Los Angeles, California. "Don't Mel Tee Good, Knight" originally "Don't Tell Me Goodnight"
Telling a knight about Mel's golf skills? "Don't Tell Knee Good Might" originally "Don't Tell Me Goodnight"
"Ye And Moo And A Bog Named Doo" originally "Me And You And A Dog Named Boo"